Thousands of web sites are hacked every day. Hackers and spammers either force entry by brute force guessing your password or they find a back door to sneak in via out of date software, bad permissions or poorly written code. Once in they can install malicious scripts or inject code into your web site. For some web site owners this can lead to unwanted spam being sent from their account. When spam is sent from a web hosting account, or directly from a computer, other mail providers are alerted to it through the use of an email blacklist. An email blacklist is a real-time database that uses set criteria to determine if an IP address from another mail server, or your own computer, is sending email that could be considered spam. There are several blacklists including Spamhaus, Barracuda Reputation Block List, and SpamCop to name a few, but they all have their own criteria for accepting inbound mail and all can have a negative affect on your delivery rate. If the incoming mail fails to satisfy the criteria for legitimate mail, the IP is then included on the list. Some ISPs opt to use this data to inform their filtering decisions and delivery of the email messages sent over that IP. It’s important to note that the blacklist provider has no control over delivery or placement of your messages. The blacklist simply serves as a tool to help ISPs and email providers make their own decisions. Your web hosting account lives on a server that holds many other accounts. If you, or another account holder, send out spam then the blacklist provider will mark the IP address of the server as the source of the problem, not the individual hosting account. As a result many people attempting to email you will receiving a warning message that their email could not be delivered to you. You may also experiencing difficulties sending email to other people as their email provider may use the same blacklisting service. If you are receiving these type of bounceback messages you can check to see if your hosting server is currently being blacklisted by using the MX ToolBox Blacklist Checker. In most cases our email monitoring services will have detected the source of the spam and will have issued a removal from the appropriate blacklist provider. These removal requests normally take around 24-48 hours to complete. 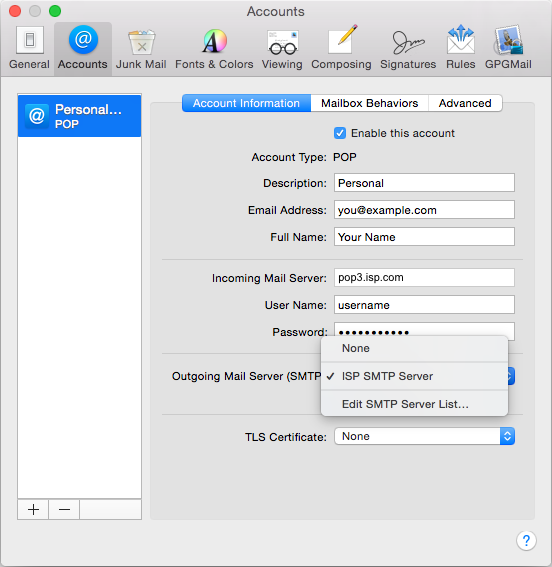 To allow the sending of email from your computer we would recommend you change your outgoing (SMTP) provider to that of your Internet Service Provider (ISP). This will allow you to send your outgoing messages through an alternative mail service provider. 1. 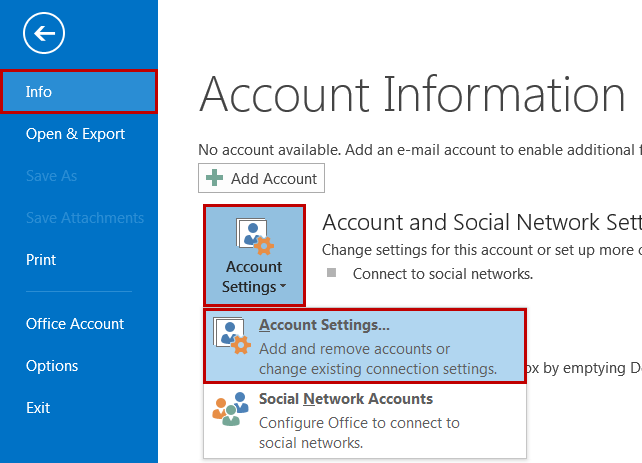 Click File > Account Settings > Account Settings. 2. Select the email account you want to change, and then click Change. 3. Under Server Information look for the outgoing mail server box and change this to be that of your ISP’s mail server (eg. mail.bigpond.com). If you are not sure what the name of the outgoing server should be please contact your Internet Service Provider and they will give you the correct information. 4. Click More Settings, and then click on the Outgoing Server tab. 6. Click on the OK button to save your changes. 1. Choose Mail > Preferences, and then click Accounts. 3. 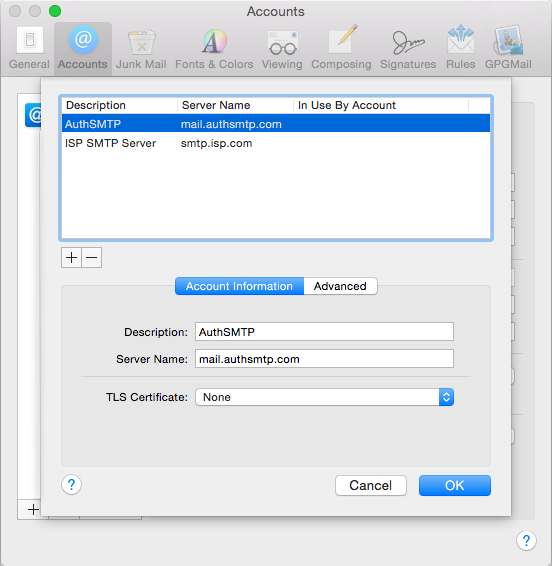 Choose Edit SMTP Server List from the pop-up menu, select the server. 4. Go to the Server Name field and remove the current server. Replace this with the name of your ISP’s mail server (eg. mail.bigpond.com). If you are not sure what the name should be please contact your Internet Service Provider and they will give you the correct information. 5. Click on the Advanced Tab. Set Authentication to None. In some cases you can be blacklisted because your computer is sending out spam. This could be due to virus or malware infection, or a large mailout that you might be distributing to your customers from your PC. Unfortunately there is nothing that WEB24 can do to resolve this issue directly as the IP address of your ADSL/Cable modem or wireless router is being black listed directly. 1. Run a full virus scan on your computer. Ensure that there are no active viruses or malware on your computer. You may need to use more than one virus scanning or malware removal tool to do this properly. 2. Review the bounceback message you have received to determine which blacklist you are on. There are several blacklists including Spamhaus, Barracuda Reputation Block List, and SpamCop to name a few. 4. Visit the web site of the blacklist provider and request that your IP address be removed. 5. If you are still experiencing problems then you will need to contact your Internet Service Provider to discuss how to change the current IP address for your ADSL/Cable modem or wireless router.